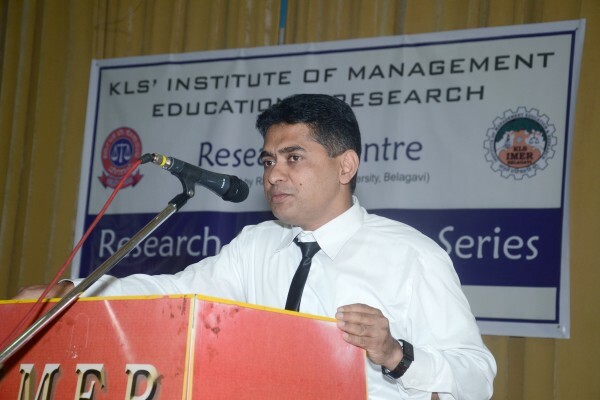 The Research Centre of KLS’ Institute of Management Education and Research, Belagavi has organized a Research Colloquium on 20th August 2015 as part of Research Colloquium series. The topic chosen for the Research Colloquium was “A reality check of contemporary research” and the resource person was Dr. M. M. Munshi, Associate Professor, VTU, Belagavi. The main objective of the Research Colloquium Forum is to expose the students and faculty members of the institute to the most current research in the field of business management. Dr Munshi in his presentation spoke on importance of Research and the status of Research in Business Management across the globe based on the research conducted by his research team at VTU, Belagavi. In his address Professor M. M. Munshi said, “Business schools in India are growing rapidly. However, if they have to make meaningful contributions to business education, research and practice, they must be rooted in high quality management research that is indigenous in its promptings and directions. Indian management research must provide cutting-edge knowledge and methods and valid indigenous theories to guide practice and to create a vibrant Indian research community”.